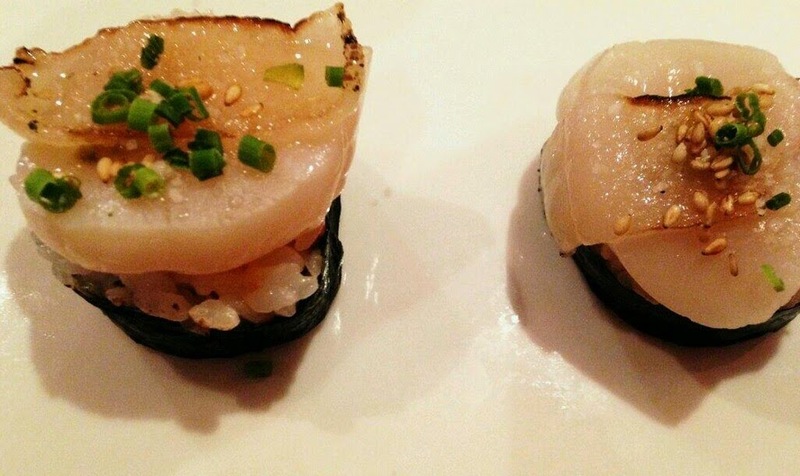 On April 2, I visited Sushi Pop for a complimentary sampling of some of its existing and potentially new menu items. I'm glad that I went as I previously had not been to the restaurant, although I always have wanted to try it out. The food I tried here definitely invigorated my interest! I sat at the counter, with the kitchen and its workers directly in front of me. Throughout the evening, I interacted with several very friendly employees. Chau, Sufian and their fellow employees were attentive, genuine and polite. I the first menu item I tried was the So Fresh & So Clean (Hawaiian yellowtail, tuna, tempura asparagus, tobanjan aioli, Asian relish, radishes). It was really good! This is something I definitely will consider ordering during future visits. The second item presented to me was the Bacon-Wrapped Scallop (below; kampyo, avocado, crab, tobanjan aioli, scallop, orange kosho, fleur de sel, chives, torched Iberico Lardo). This was excellent and one of my favorite sampled items. I might have the order wrong, but next up may have been the boquerones, which were prepared with an aioli, spicy garlic panko and fried capers. I've never been a fan of anchovies, but these were very good and totally different from my general perception of anchovies. 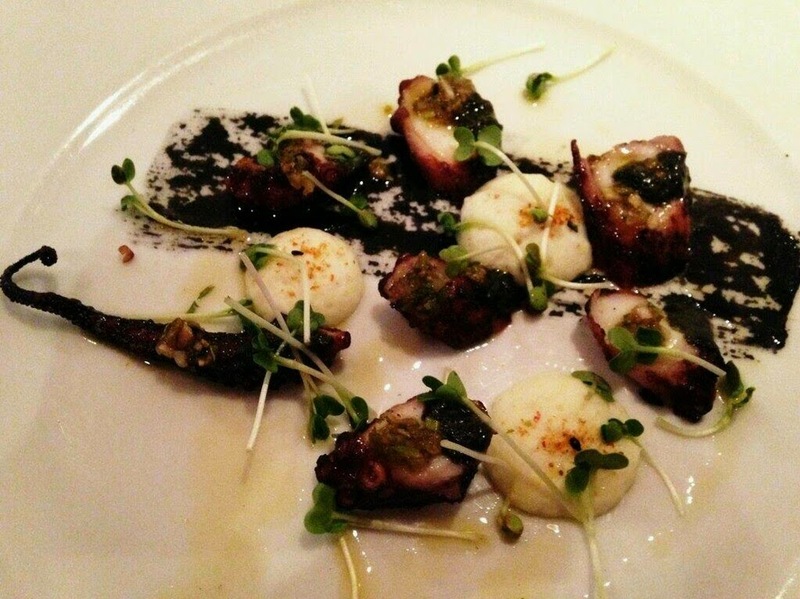 The Octopus a la Plancha (below; charred white scallion and shishito chimichurri, nori purée, sweet potato) was another one of my favorites. 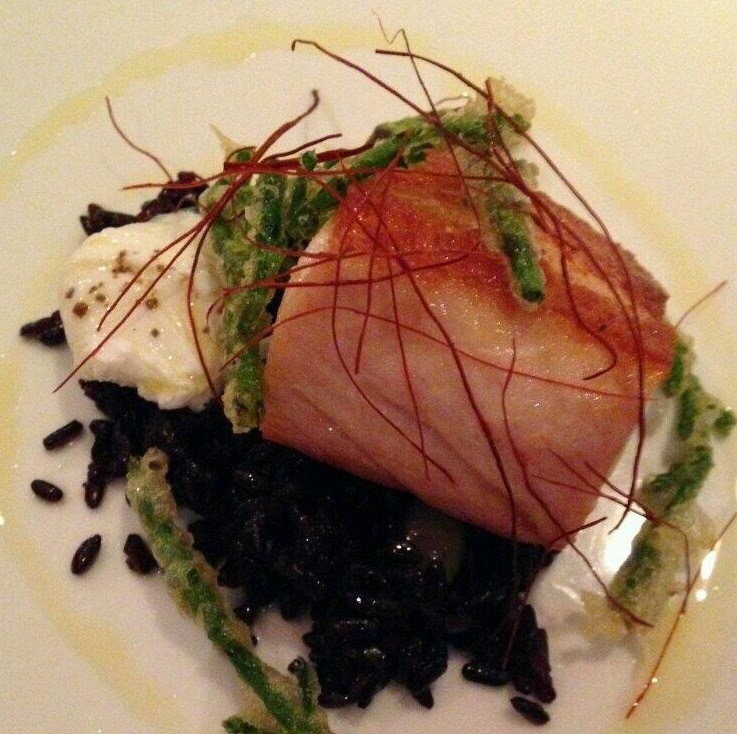 Perhaps the best item I tried was the Black and White (below; cobia, venere rice, black edamame, poached quail egg, yuzu vinaigrette, tempura sea beans). As far as I can remember, I never had cobia until going to Sushi Pop. I was very impressed by its presentation and preparation. The cobia was tender and delicious. I highly recommend the Black and White. 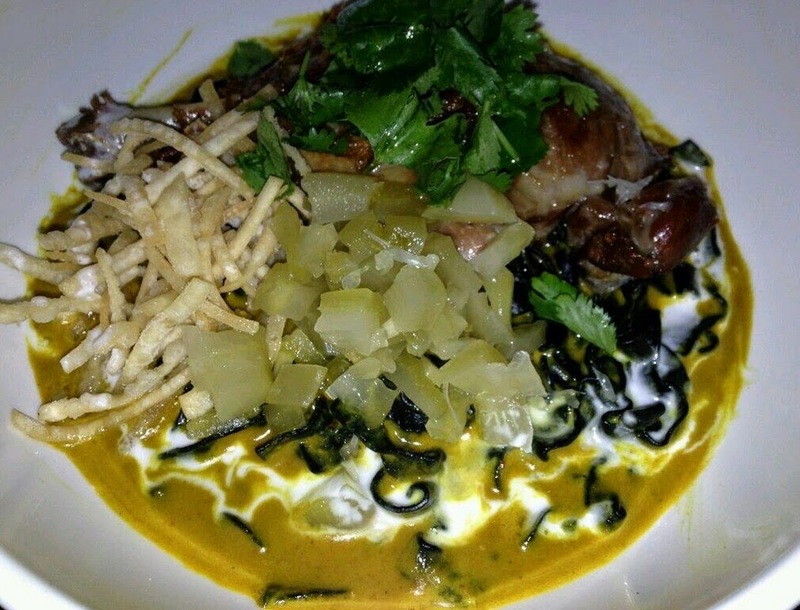 Up next was the Khao Soi (below; duck confit, spicy Burmese curry, squid ink gochugaru noodles, house pickled cabbage, coconut milk). I liked what I tried of this, although I was unable to finish all of it since I was getting pretty full. 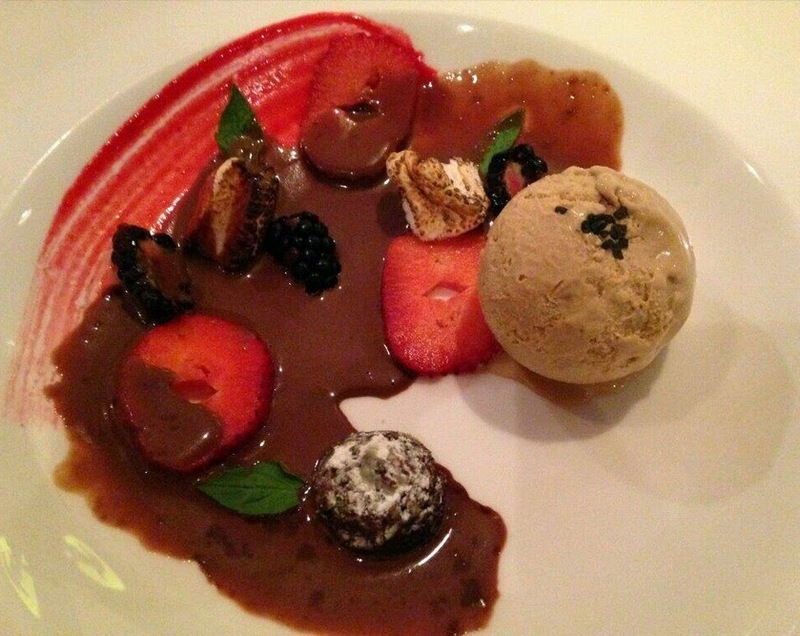 I did save a little bit of room for dessert, though, and ate all of the Hot Chocolate Soup (below; seasonal berries, chocolate cake, toasted marshmallow, Japanese black sugar ice cream, spiced chocolate drizzle). This was one of the best desserts I've ever had! Each ingredient perfectly complemented the others. I especially enjoyed the spicy chocolate drizzle, which definitely had a "kick" to it. I think this item is new or not yet on the menu, but I'm sure it'll be very popular once it becomes a menu mainstay. I absolutely would order it again. I also plan to try the Peanut Butter and Jelly Sorbet during my next visit. Overall, this was an excellent experience. I hope to make it to Sushi Pop again soon. It's a very interesting, unique and impressive restaurant. I now know why it is so well-liked in our community. Thank you, once again, to Chau, Sufian and the Sushi Pop staff for accommodating me and making me feel very welcome!